A lot of Baptist will talk about the Greek word “Eis” in Acts 2:38. They say it means because of. How do I explain that to them? When Baptists teach that salvation is by faith only and that there is nothing a person can or must do to be saved, they contradict very clear passages of Scripture. Must a person believe in order to be saved? (Heb. 11:6). Must a person repent of sin in order to be saved? (Luke 13:3-5). Must a person be baptized for the remission of sins in order to be saved? (Acts 2:37-38). Someone answering from an unbiased point of reference would say yes, yes, and yes. Because it is clearly what the Bible says. However, a good Baptist will reply yes, yes, and no. Because they are answering from the biased reference point of denominational doctrine. And, when they are called on to explain why they would say that baptism is not essential to a person’s salvation, they twist and squirm their way through the very clear teaching of Scripture, making up all manner of nonsensical and illogical explanations. Their use, or misuse, of the word eis is just one example of this. In themselves the words can express aim or purpose …. But then another usage exists which is just as good Greek as the use of [eis] for aim or purpose. It is seen in Matt. 10:41 in three examples … where it cannot be purpose or aim, but rather the basis or ground, on the basis of the name of prophet, righteous man, disciple, because one is, etc. It is seen again in Matt. 12:41 about the preaching of Jonah …. They repented because of (or at) the preaching of Jonah. The illustrations of both usages are numerous in the N.T. and the Koiné generally (Robertson, Grammar, p. 592). One will decide the use here according as he believes that baptism is essential to the remission of sins or not. My view is decidedly against the idea that Peter, Paul, or any one in the New Testament taught baptism as essential to the remission of sins or the means of securing such remission [emp. mine, NSF]. So I understand Peter to be urging baptism on each of them who had already turned (repented) and for it to be done in the name of Jesus Christ on the basis of the forgiveness of sins which they had already received (Robertson, A. (1997). Word Pictures in the New Testament (Ac 2:38). Oak Harbor: Logos Research Systems). 1519. eis; prep. governing the acc. with the primary idea of motion into any place or thing; also of motion or direction to, toward or upon any place, thing. The antithesis is expressed by ek (1537), out of (Zodhiates, S. (2000). The complete word study dictionary : New Testament (electronic ed.). Chattanooga, TN: AMG Publishers). Maybe now we know why denominationalists have abandoned the ASV! Its too accurate for them. So, respected Greek Lexicons, Word Studies and Grammars agree that eis means into, unto, toward, upon, etc. The vast majority of English translations agree that eis is to be translated to, for, into, at, etc. never because of! Even if you allow them their unwarranted use of eis to mean because of in certain instances, which there is no good evidence that you should, but even if you did allow for it, Robertson says “One will decide the use here [Acts 2:38] according as he believes that baptism is essential to the remission of sins or not.” So lets see how the word eis is used in connection with baptism and/or the remission of sins. Acts 2:38 says, eis aphesin ton hamartion [into sending off of the sins]. In Matthew 26:28, Jesus says His blood was shed eis aphesin hamartion [into sending off of sin]. In English, baptism is for the remission of sins and the blood of Christ is for the remission of sins. The wording in the Greek is nearly identical! So, if for remission of sins Acts 2:38 means because of remission of sins, why doesn’t it mean because of remission of sins in Matt. 26:28? If baptism is because of the remission of sins then the blood of Christ is because of the remisson of sins. If not, why not? And, if the Baptists will say that baptism is because of the remission of sins means that baptism is not essential to salvation then neither would the blood of Christ be essential for salvation! The Baptists treatment of the Greek in Acts 2:38 actually has them denying the essentiality of the blood of Christ to our salvation! When we see the connection that baptism has to the blood of Christ it is easy to see how both the blood of Christ could be said to be for remission of sins and baptism could be said to be for remission of sins. Paul said that he was baptized to have his sins washed away (Acts 22:16) and Rev. 1:5 says Christ is the one who loved us and washed us from our sins in His own blood. Paul recognized the point at which he was washed in the blood of Christ was the point of his baptism. That is what he wrote in Rom. 6:3-5. 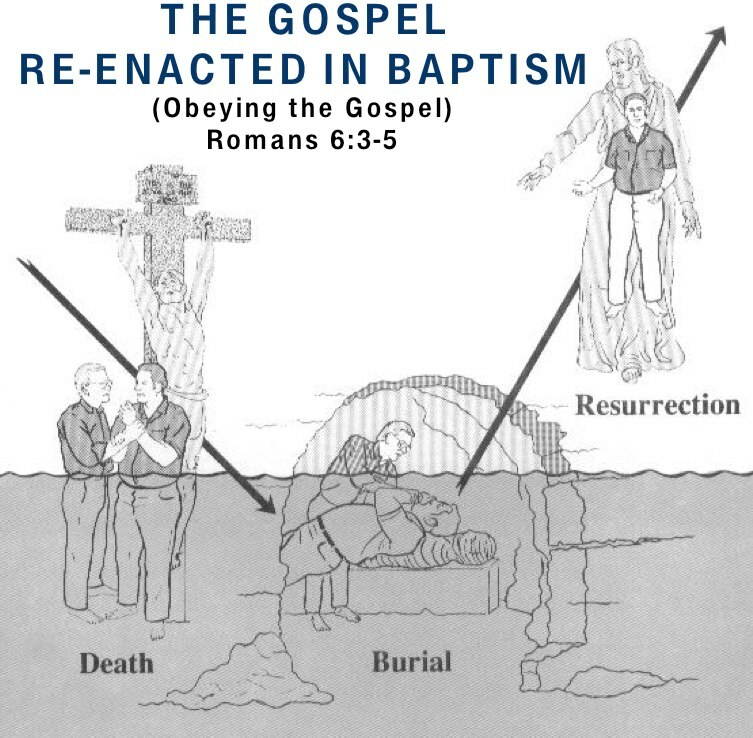 When we humbly submit to the doctrine of Christ in baptism we are emulating the death, burial and resurrection of Christ. We are buried with Him through baptism and raised with Him in newness of life. Christ shed His blood for [eis, Matt. 26:28] the remission of our sins in His death on the Cross. We contact that redeeming blood when we are baptized into that death. In other words, His death pays the price for our sins when we are baptized into that death. Where is newness of life in this passage, before or after baptism? One is baptized into Christ, into His death, then raised with Him to walk in newness of life. There are numerous passages revealing the essential nature of baptism to salvation: Mark 16:16; Acts 2:38; Acts 22:16; Rom. 6:3-4; Gal. 3:26-27; Col. 2:12; 1 Pet. 3:21; et. al. Yet Baptists, and others, vainly attempt to explain away each one instead of simply humbly submitting to the doctrine of Christ. I put this question up for discussion for the Facebook Group: What Does The Bible Say. Click here to check it out now. Great to hear from you. Trust you are enjoying your new home here in Jerseyville! Peter calls upon them to prove the genuineness of their repentance by submitting to public baptism. In much the same way, our Lord called upon the rich young ruler to prove the genuineness of his repentance by parting with his wealth (Luke 18:18–27). Surely, however, no one would argue from the latter passage that giving away one’s possessions is necessary for salvation. Salvation is not a matter of either water or economics. True repentance, however, will inevitably manifest itself in total submission to the Lord’s will. Second, such teaching violates the important hermeneutical principle known as analogia Scriptura (The analogy of Scripture). That principle states that no passage, when correctly interpreted, will teach something contradictory to the rest of Scripture. And the rest of Scripture unmistakably teaches that salvation is solely by faith (cf. John 1:12; 3:16; Acts 16:31; Rom. 3:21–30; 4:5; 10:9–10; Phil. 3:9; Gal. 2:16). Third, after condemning the ritualistic religion of the scribes and Pharisees, our Lord would hardly have instituted one of His own. F. F. Bruce remarks, “It is against the whole genius of Biblical religion to suppose that the outward rite [of baptism] had any value except in so far as it was accompanied by true repentance within” (The Book of the Acts [Grand Rapids: Eerdmans, 1971], 77). Fourth, this interpretation is not true to the facts of Scripture. Throughout the book of Acts, forgiveness is linked to repentance, not baptism (cf. 3:19; 5:31; 26:20). In addition, the Bible records that some who were baptized were not saved (Acts 8:13; 21–23), while some were saved with no mention of their being baptized (Luke 7:37–50; Matt. 9:2; Luke 18:13–14). The story of the conversion of Cornelius and his friends very clearly shows the relationship of baptism to salvation. It was only after they were saved, as shown by their receiving the Holy Spirit (Acts 10:44–46), that they were baptized (vv. 47–48). Indeed, it was because they had received the Spirit (And hence were saved) that Peter ordered them to be baptized (v. 47). That passage clearly shows that baptism follows salvation; it does not cause it. In 1 Corinthians 15:1–4, the apostle Paul summarizes the gospel he preached and by which the Corinthians had been saved. There is no mention of baptism. Further, in 1 Corinthians 1:14–16, Paul rejoiced that he had baptized none of the Corinthians except Crispus, Gaius, and the household of Stephanas. That statement is inexplicable if baptism is necessary for salvation. Paul would then in effect be saying he was thankful that only those few were saved under his ministry. The apostle clearly distinguishes baptism from the gospel in 1 Corinthians 1:17, where he says that “Christ did not send me to baptize, but to preach the gospel.” How could Paul have made such a statement if baptism was necessary for salvation? While the preposition eis (‘for’) can mean “for the purpose of,” it can also mean “because of,” or “on the occasion of” (A. T. Robertson, Word Pictures in the New Testament [Grand Rapids: Baker, reprint of the 1930 edition], 3:35–36; H. E. Dana and J. R. Mantey, A Manual Grammar of the Greek New Testament [Toronto: Macmillan, 1957], 104). The latter is clearly its meaning in Matthew 12:41, which says that the people of Nineveh repented because of the preaching of Jonah. The order is clear. Repentance is for forgiveness. Baptism follows that forgiveness; it does not cause it (cf. 8:12, 34–39; 10:34–48; 16:31–33). It is the public sign or symbol of what has taken place on the inside. It is an important step of obedience for all believers, and should closely follow conversion. In fact, in the early church it was inseparable from salvation, so that Paul referred to salvation as being related to “one Lord, one faith, one baptism” (Eph. 4:5). Baptism, like all of Christ’s commands, needs to be obeyed. If you have endured this far–then you deserve a metal–or at least coffee sometime! I sincerely appreciate Mr. Georgeff’s response but I have to wonder if he actually read what I wrote above. If he did he surely would not have used the very arguments that I had already refuted. I would also ask Mr. Georgeff to please do a concordial search for “faith only” or “faith alone” and see what comes up. Surely if “salvation is solely by faith” then it would say that somewhere in the Bible. I would like to see one single verse anywhere that says salvation is by “faith alone” or “faith only.” Please provide a verse anywhere that uses such a term. I’m not sure if Mr. Georgeff will be willing to continue our discussion here, or in a public forum, but I will post a fuller response to what he has written above. In Mr. Georgeff’s letter (above), he makes several points as to why he believes eis means because of. His first statement is the same old answer Baptists always give, baptism is the outward show of an inward faith. Those weren’t his exact words but that’s what he said. When he said that Peter calls on them to prove the genuineness of their repentance by submitting to public baptism, that is what he is saying, baptism is the outward show of an inward faith. But, I ask, where does the Bible ever call baptism a symbol? Baptism is not a symbol of anything, it is an act of obedience to the faith (Rom. 1:5; 16:26). The comparison of baptism to what Jesus told the rich young ruler (Luke 18:18-27), is taking both grossly out of context. When Jesus told the rich young ruler to go and sell what he had and then come follow Him, he was pointing out to the rich young ruler that there was something hindering him from full faithfulness to God. He was talking to someone who was already in a covenant relation with God, not an alien sinner (Luke 18:20-21). There is no application or parallel whatsoever between the rich young ruler and the doctrine of baptism. I completely agree with the principle Mr. Georgeff refers to as analogia Scriptura, though I’ve never heard it called that. Truth is truth and will never contradict itself. If a person’s understanding of one passage causes a contradiction with another passage then their understanding of one or both is incorrect and must be harmonized with everything else the Bible teaches. I contend that it is Mr. Georgeff and denominationalism that is presenting a position that causes contradictions. He says that baptism cannot be required for salvation because that would contradict the doctrine that salvation is solely by faith. That is true, it does contradict the denominational doctrine of faith only salvation. But it does not contradict the biblical doctrine of salvation. It becomes clear that Mr. Georgeff is attempting to defend a man-made doctrine, and not Scripture, when you see the passages he uses. He claims that these passages teach salvation is solely by faith. However, they do not! The passages cited, like John 1:12 and John 3:16, state that salvation is received by those who believe in Christ. The problem is with the idea that biblical faith can be separated from obedience. There is no such thing as biblical faith without obedience! (Jas. 2:17-18). Every example of Hebrews 11 shows that faith is expressed through obedience. It is the false doctrine of faith only salvation that contradicts the Bible. Notice Mr. Georgeff’s use of Acts 16:31 in an attempt to show that salvation is solely by faith. Who’s understanding of Acts 2:38 actually contradicts the account of the Philippian jailor in Acts 16:25ff? Mr. Georgeff says the jailor was saved in Acts 16:31 when Paul told him to believe on the Lord Jesus Christ. However, when does the text say that the jailor did what Paul told him to do in Acts 16:31? It is in Acts 16:34, having believed in God with all his household. After he had heard the word of God preached (Acts 16:32). After he had washed Paul and Silas’ stripes (Acts 16:33). After he and his household had been baptized (Acts 16:34). To go to Acts 16:31 and say that it proves salvation is solely by faith, in isolation from the rest of the passage, is ignorant at best and outright dishonest at worst. When Paul told the jailor to believe on the Lord Jesus Christ in Acts 16:31, the jailor hadn’t even heard the gospel! When Paul answers the question, what must I do to be saved? (Acts 16:30), the text then goes on to show what the jailor did in order to believe on the Lord Jesus Christ. If it was not essential to his believing on the Lord Jesus Christ for him to be baptized then why be baptized in the middle of the night, after an earthquake and nearly committing suicide? Seems to me like he might of said, now that I’m saved solely by faith I can get some rest after this very traumatic night and schedule my baptism for when I can be together with the church. No, that kind of thinking only comes with man-made denominational doctrine! When someone understands the necessity of baptism there will be a sense of urgency involved. The kind of urgency that would lead someone to be baptized in the middle of the night (Acts 16:33), or in a pool on the side of the road (Acts 8:36). The passages from Romans are another example of isolating passages from their context, which leads to contradictions. When Paul is making the distinction between faith and works in Romans, he is dealing with a specific problem with the Jewish converts to Christ. They were being converted from a corrupted system of Judaism that had emphasized formalism over faithfulness (cf. Matt. 23:23). They believed that as long as they went through the form they merited their salvation. Paul begins speaking directly to the issues being confronted by the Jewish converts in Romans 2 and continues through Romans 11 (cf. Rom. 2:1, 3, 17; 9:1-4; 10:1-2). Failing to recognize the context and claiming that Paul is teaching faith only salvation brings Paul into contradiction with James (Jas. 2:17). John Calvin was so convinced of the false doctrine of faith only salvation that he said James was not an inspired book of the Bible. He could not reconcile the supposed contradiction between Paul and James so he was brought to the point of having to throw out a book of the Bible! Instead of properly understanding the contextual setting, he wanted to hold to his man-made doctrine and so was faced with irreconcilable contradictions. There is no contradiction between Paul and James when one understands that they are talking about two different kinds of works. Paul is talking about meritorious works, which is the wrong notion that salvation can be earned, and James is talking about works of faith, without which salvation is not possible. It never ceases to amaze me how denominationalists will go to a book that begins and ends with Paul’s statement that his work was to produce obedience to the faith (Rom. 1:5; 16:26), and say that it teaches faith only salvation. Again, Philippians 3:9 is another example of a passage being taken out of its immediate context to teach something that the passage does not say. If you read the context prior to Phil. 3:9 Paul is talking about the same Jewish problem he was addressing in Romans. They believed that God owed them salvation because of their lineage (Phil. 3:2-6). He says he gave up all this reliance on his lineage and heritage to live according to the righteousness that is through faith (Phil. 3:7-11). The righteousness that is through faith is the Christian lifestyle directed by the word of God, the faith (Jude 3). How does that passage teach that salvation is solely by faith? It doesn’t! It looks like we have a very clear pattern here with the passages Mr. Georgeff uses in an attempt to wrongly say the Bible teaches salvation is solely by faith. The context of every single one of those passages is dealing with the Jewish problem of emphasizing form over faith, i.e. meritorious works. Notice the context of Galatians 2:16. Paul is referring to the time he had to rebuke Peter for hypocrisy when he refused to eat with Gentiles whenever there were Jews present (Gal. 2:11-13). Paul was constantly having to confront Judaizers in his work. They caused him no small amount of trouble. They were going around teaching the Gentile converts that they had to keep the law of Moses as Christians (Col. 2:16-17). But Paul never taught the false doctrine of faith only salvation. I will deal with the remainder of Mr. Georgeff’s letter in another post. I have researched this “eis in Acts 2:38″ question a lot. Is there a reason why nobody seems to notice Peter’s words at the end of the verse ” AND YOU WILL receive the gift of the Holy Spirit” (NASB)? The words “and you will” (l?mpsesthe in Greek) seem to make it very clear that the crowd had not had the gift of the Holy Spirit and that Peter was telling the crowd what to do in order to get the Holy Spirit.